We've had quite a few experiences with Pizza Hut in the past few years, especially this summer. And each time, Pizza Hut Cares has been wonderful with apologizing and sending us something to make up for the problem. Last week while my parents were here visiting, we decided to order pizza to be delivered since it was already 7 p.m. They make it so simple online, and have options where I can choose light sauce, etc. And, you pay online so all you have to do is sign when they bring it to your door. Well, last Thursday night after I placed the order for delivery, the delivery time was around 8:25; which we felt was ridiculous since we literally live over the mountain about five minutes from them. So on my confirmation email it listed a number to call if you had any changes or needed to cancel. Well, we didn't want to cancel, we just decided it was best to go pick up the pizza ourselves. I never spoke to the store, after all, these days you only speak to automated phone services. But after ten minutes of pushing 1, 0, #, and then staying on the line to wait for the next representative... I told them to let our store know I was coming to pick up our order. NOT to deliver it. He said perfect, and your order will be ready in fifteen minutes. Now, that's MUCH better than the hour and a half wait I was given before. The Mr and I head over to Pizza Hut, and I see my name on the screen and it says, READY! So I give the girl at the counter my name and she tells me how much it will be. I explained to her that I paid online. She then has to get her manager, who decided he wanted to be rude and not explain why I needed to pay now, just kept telling me that I hadn't paid. FINALLY the Mr said something to him, and he calmed down and explained that they don't close out the order until after the pizza is delivered, and since it wasn't being delivered, they canceled my pre-authorization on my card. Why he didn't explain it like that in the first place, I'll never know. We start to see panic spread on everyone's faces when they start looking for our pizzas. All while the Mr and I are looking at two large boxes with a smaller box for cheese sticks on top of it sitting on the counter to the left of everyone. After about five minutes of everyone whispering and looking all confused, the manager comes to us and tells us his delivery guy has our pizzas and he's in our driveway!! I said no problem, my parents are at home and can sign for them, I'll call them now. My dad answered the phone and he said, there is no one in the driveway, but I'll keep a look out for them. And as soon as I was talking to him about not paying, etc... the manager yells out... FOUND IT. Yep, it was the pizza boxes we were looking at the entire time. Here's the best part... the manager had already told the girl making the pizzas to make us another round, and it was in the oven. So, he asked us to wait another 8-10 minutes and we would have hot pizzas. And he gave us the original order, too. 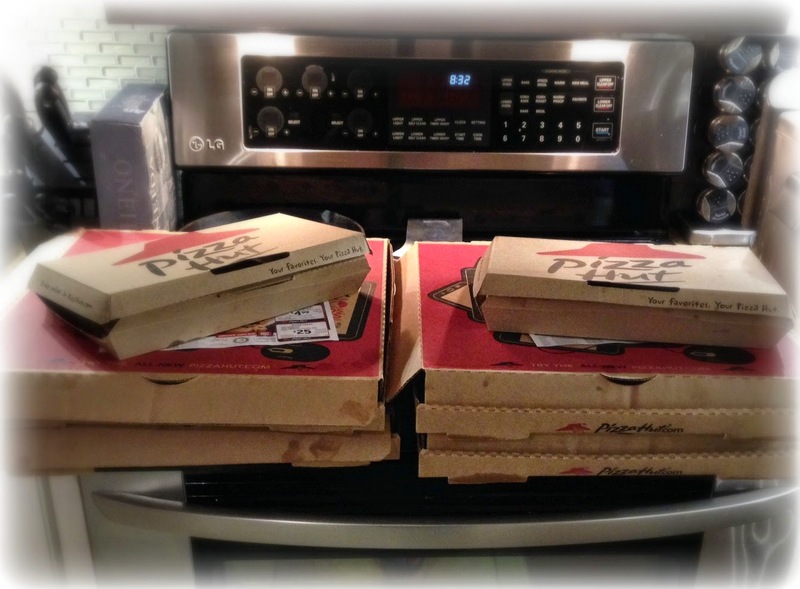 So needless to say, we had PLENTY of pizza and should have invited the neighbors over. And we still got home and were eating our dinner waaay before our delivery was scheduled to arrive. We were cleaning up the kitchen when I took the pictures below, at 8:32 p.m.
Oh, and we still have pizza leftovers in the fridge! Thanks again Pizza Hut for always making our experiences with you memorable.